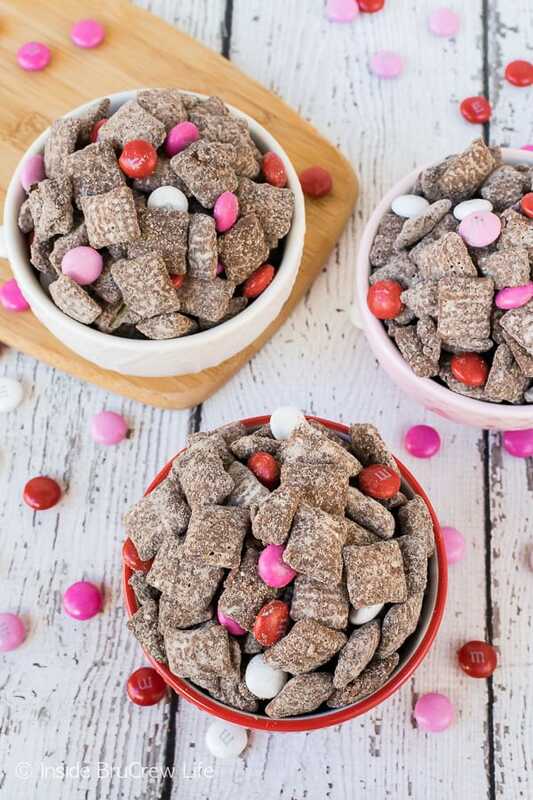 Make a bowl of this M&M’s Brownie Batter Muddy Buddies for your sweethearts this week. 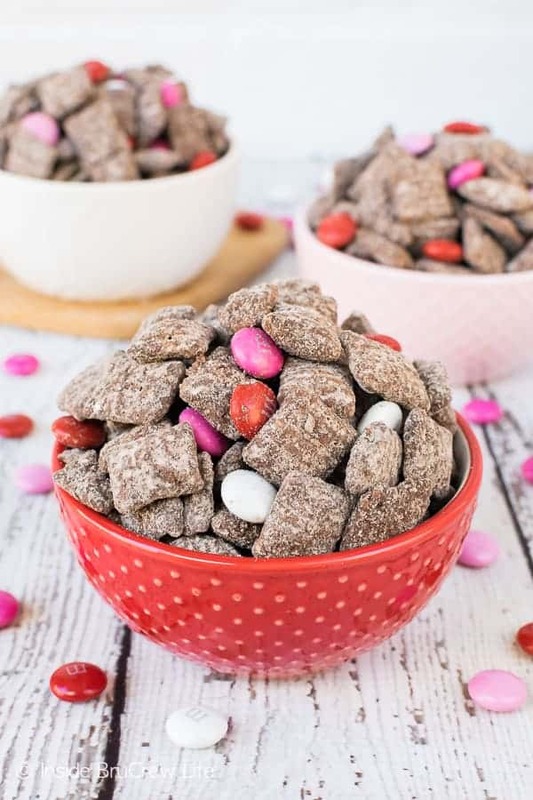 This easy Valentine’s snack mix is the perfect way to say I love you to your loved ones this week. Say hello to my snacking downfall. Any type of easy snack mix that sits on my counter is dangerous. It’s dangerous because it’s too easy to just grab a handful every time I walk by. 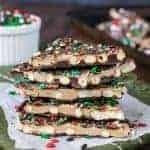 If that snack mix is coated in chocolate and powdered sugar and loaded with little candies, one handful usually turns into two or three handfuls. Or more. I try to hide it by putting it in a container that I can’t see in or putting bread on top of the container, but it doesn’t help because I know that sweet goodness is inside. I’m pretty sure that’s why it’s been two years since the last muddy buddy creation! Two years!!!! I can’t even believe that it’s been that long since I made this pretty pink strawberry shortcake muddy buddies. 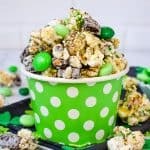 I also looked and saw that I only made and shared two new sweet popcorn recipes on the blog last year. Apparently my dessert brain decided to take a break from easy snack mixes. Or my hips and thighs said no more! But that’s about to change today because I had a craving that had to be fixed. 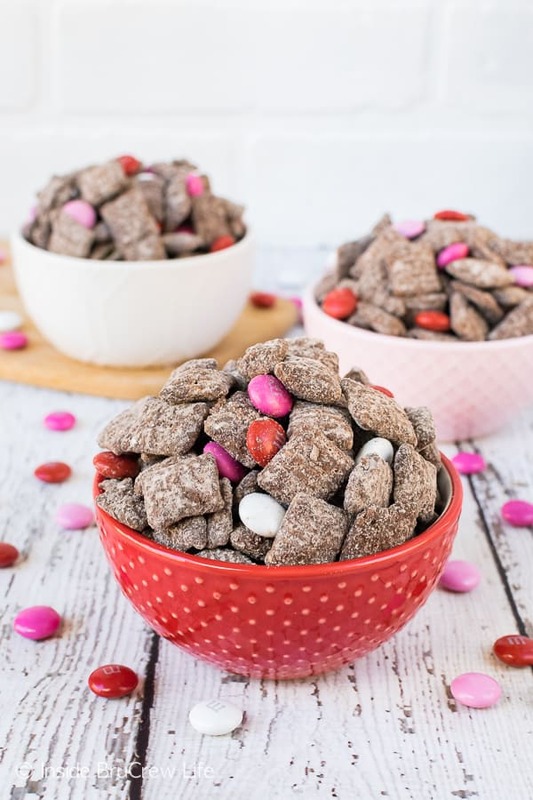 For this sweet mix I used some dry brownie mix and powdered sugar to shake all over the chocolate coated cereal. 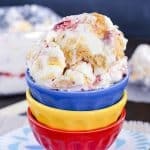 Get ready to go to town on this sweet treat. 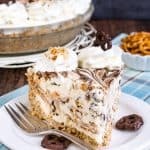 And then with the extra brownie mix you have leftover you can make this brownie batter coffee ice cream and these little brownie batter chocolate chip cheesecakes for dessert later this week. Oh, yeah! Brownie batter goodness all week long!!! Do it! Add your favorite flavor of candies to give this M&M’s Brownie Batter Muddy Buddies a fun pop of color and taste. My biggest tip for you when you make muddy buddies is to use a big bowl. Bonus points if that bowl has a lid for you to use too instead of moving it all to a Ziplock bag. 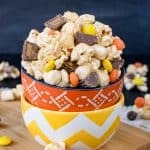 You can stir the cereal and chocolate together in the bowl and then sprinkle on the brownie sugar mix a little bit at a time just by putting the lid on and shaking gently. If your bowl doesn’t have a lid, scoop the mixture quickly into a big bag and shake, shake, shake! Either way, you will be enjoying some M&M’s brownie batter muddy buddies in less than 15 minutes. 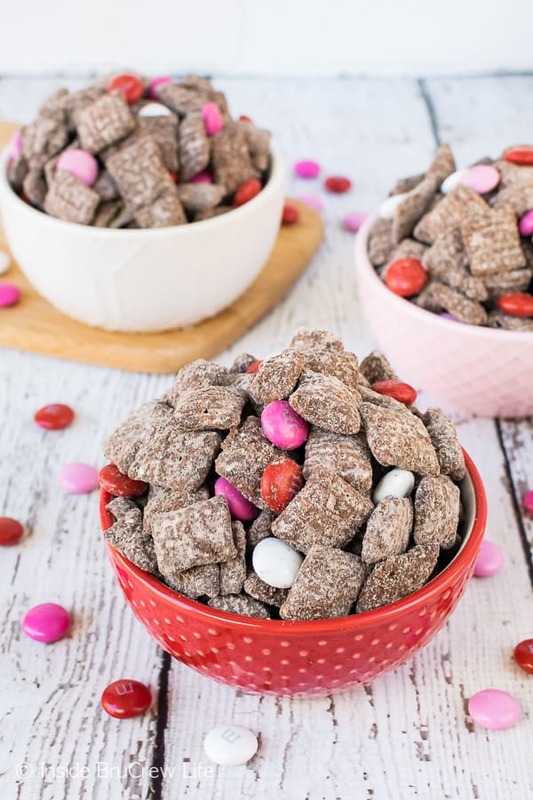 M&M's Brownie Batter Muddy Buddies - powdered sugar, brownie mix, and bright colored candies make this easy snack mix a fun treat to make and eat. Package it into little bags with heart tags for a fun Valentine treat. Stir together the dry brownie mix and powdered sugar. Set aside. Place the cereal in a large bowl that has a lid. Melt the chocolate according to the package directions. Pour over the cereal and gently stir until everything is coated. Open and sprinkle the remaining brownie powder on top of the cereal. Close and shake gently again. Pour onto a large tray and let set. Sprinkle with M&M's candies. Store in a tightly closed container or bag. *If you do not have a bowl with a lid, spoon the chocolate coated cereal into a large Ziplock bag before shaking the brownie powder on it. 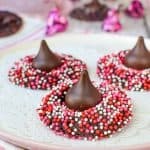 They are chocolate wafers or discs that you melt down and can dip candies in or coat things in. I like the ghirardelli melts the best. Those you can find in the baking aisle of most stores.